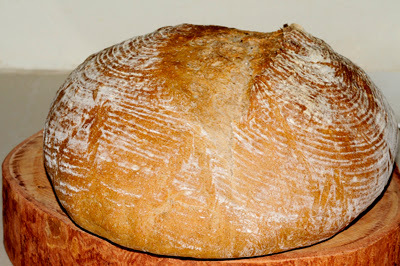 When you follow my blog, you see I bake almost all my loaves with recipes I find at other blogs. I like to have a look at what other home bakers bake and how it turns out in their kitchen. I have just a few books on baking bread and now I had the opportunity to get another book. 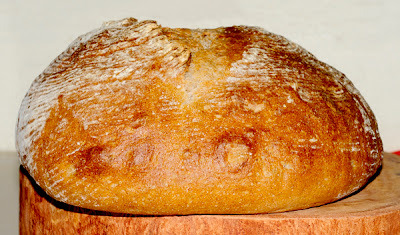 A while back I wanted to join Mellow Bakers when they choose The Handmade Loaf by Dan Lepard. It’s not a very expensive book and I was ordering the book with Amazon on line. At the end of the ordering session I discovered they wouldn’t send the book to Thailand. I still have no idea why they don’t send it. So, I didn’t join the Mellow Bakers with Dan Lepards’ book. I forgot all about it until a friend of us went back to England for a family visit. Then I realized I could order a book and have it send to his mother. This was the opportunity; ordering a book, having it send to England and brought to Thailand. But which book to choose? I took it seriously and asked my fellow home bakers. 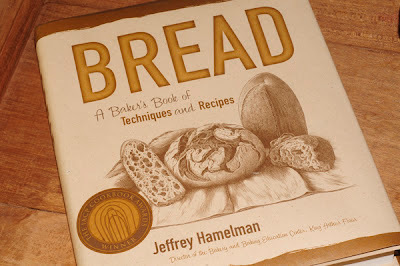 The verdict was unanimous: Jeffrey Hamelman’s Bread, is the book to have. ‘Not for beginners’, they all said. I’m baking for more than a year now and still I can learn a lot. With an address in England it’s easy to order a book. After a few weeks the friend returned and my book came. Off course I wanted to thank him and what better gift than a freshly baked bread to thank him for bringing back the book on BREAD. I wanted to be sure and choose Norwich Sourdough. It’s a delicious good recipe I found at Susan’s Wild Yeast. Susan's Norwich Sourdough is adapted from Jeffrey Hamelman's Vermont Sourdough. I’ve baked this many times and in many variations. I decided to bake two loaves; 1 brown and 1 white. When we gave the loaves to our friend, his wife placed them on the table. Our friend’s wife is Thai and she doesn’t normally eat bread. She got a knife and cut some pieces to taste it. The biggest compliment was she couldn’t stop eating. I told her I was surprised, because she doesn’t eat bread. She said: ‘but this is really good bread, with a good structure and delicious taste’. Yes, we know this is how bread supposes to taste. Off course I immediately started to read the book and it’s full of information; technical and recipes. There are 415 pages, so I have enough to read and a lot of recipes to bake. And enough to convert. Maybe next time mr. Hamelman will also use the metric system? My first impression is: ‘wow, Jeffrey Hamelman really knows what he’s doing. And he knows how to put it in writing too’. So, I’m happy! The evening before (8 - 12 hours) I mixed the ingredients for the Mature Culture. I left it in a plastic container with a lid for the night in my kitchen. The final dough: I added all of the ingredients, except salt, in the mixing bowl of a spiral mixer and mixed until all was well combined. After 20 minutes I added salt. I mixed on first speed for 3 minutes and on second speed for 4 minutes. The dough should be supple, with a medium gluten development. Bulk Fermentation: transfer the dough to a slightly oiled container, cover and leave for 2 – 2.5 hours. Stretch and fold the dough two times at 50-minute intervals. Shaping: I divided the dough into two pieces and loosely pre shaped into balls. Covered with a towel and left for 15 minutes to rest. Transferred them to the floured linen couche, covered with a moist towel and a plastic bag. Proofing: I proofed the loaves for 2 – 2.5 hours. Because of the warm/hot temperature in our house I watch them to prevent over proofing. Preparing and Baking: When the oven is hot enough I boil water and pour it in a glass bottle with a long neck. I pour some boiling water on the hot stones and quickly close the oven door to keep the steam in the oven. I place the loaves on parchment on a peel. Transfer them to the oven and quickly slide the loaves on the baking stone. After some minutes I add some more water to get more steam. I baked the loaves 12 minutes with steam and quickly removed the parchment paper and the steam pan. I baked the loaves for another 33 minutes. Bake the loaves until they are nicely brown colored. Cooling: Let the loaves cool completely on a wire rack. What did you bake this month? Don’t forget to show it. I have this book...but I mostly use it for reference and inspiration. One day, I plan on baking from it ;). Beautiful loaf, Connie. Thanks Heather, it was fun to bake a loaf and give it away. You should bake from this book, it's amazing. Or I must say, Jeffrey Hamelman is an amazingly great baker. Even though I just started to bake from this book, so far the recipes are very good. This is beautiful Connie! I love that book. Thank you Karen, I just started to bake from his book and I can't stop. Everything I bake is just good! I think I'll just everything from his book.